5e-version comes with cool ToB-critters! For almost a millennium, a vast oak, buildings in the branches, stood as the proud regent of the forest, guarded by a proud dryad and druidic allies. The druids have gone, though, and now, rot is spreading through the vast forest, courtesy of the dryad being infected by the eponymous blight, represented rules-wise by the duskthorn dryad here. What’s that, you ask? Well, this conversion to 5E actually sports two uncommon monsters – the aforementioned dark dryad and the sap demon, both taken and properly credited to Kobold Press’ excellent Tome of Beasts. And yes, the stats are reprinted here for your convenience! Now, a flayed druid, plant monsters and worse remain, and the dryad enjoys hit and run tactics – tree stride is really effective when everything around you is a tree…so the PCs will need to be smart, withstand the dryad and her cold iron hedgeclippers…and hopefully find a way to stop the fungal blight. 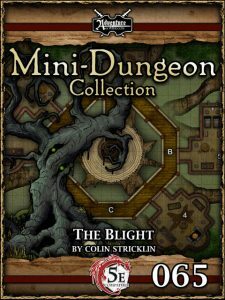 The 5E conversion of Colin Stricklin’s “The Blight” was handled expertly by Chris Harris – the use of the ToB-monsters adds a distinct identity to the pdf and the hazards etc. have been properly adjusted to represent 5e-rules as well, making this, in its own way, just as strong as the PFRPG-version – 5 stars + seal of approval.